Our Abpromise guarantee covers the use of ab109951 in the following tested applications. 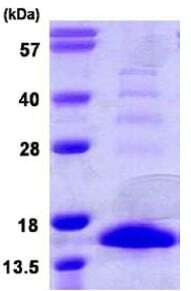 ab109951 was purified using conventional chromatography. ab109951 has not yet been referenced specifically in any publications. Publishing research using ab109951? Please let us know so that we can cite the reference in this datasheet. I was curious if recent batches of this recombinant protein have been LAL tested for LPS and if they were now endoxtoxin free? The laboratory tested the endotoxin level of ab109951, and it’s below (<) 1EU/ug. Thanks for the reply. Unfortunately it is not possible to use the protein with higher concentration of LPS/endotoxin for our purposes. Still thank you and I am sure that there will be something else we will order in the future from your company. We are sorry that we cannot be of more help on this occasion. We - the technical team - would like to wish you good luck with your research, and are always at your service, should you require further expert advice. Have a great weekend! Have you determined the endotoxin level? Thank you for your inquiry. My colleague is currently on tour for Abcam in Germany, but before she left she inquired about the endotoxin level of S100A9 protein ab109951. I was informed that, regrettably, the Endotoxin concentration of this protein is above 1.0 EU per 1 microgram of protein as determined by LAL method. I hope this information is helpful to you. Please do not hesitate to contact us if you need any more advice or information.